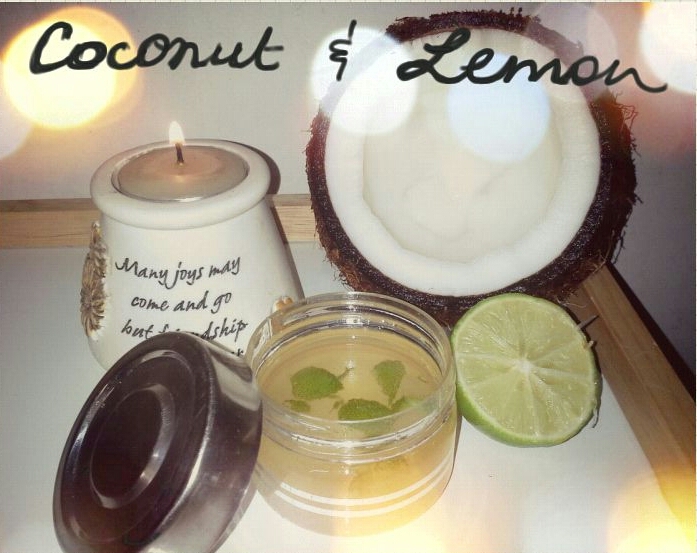 Coconut and lemon sugar scrub – A moisturizing and fragrant treat for your hands and senses! This hand scrub has nourishing and softening properties of coconut oil and a little almond oil as well for moisturizing the cuticles and nail bed, lemon juice to lighten the skin post tanning and to brighten it with regular use. A little zest of lemon with lemon or citrus essential oil to give this scrub that uplifting fragrance! Sugar scrubs are fabulous to slough away all the hard spots on the elbows and the dry bits. They reveal fresh skin once you wash it off! Lemon essential oil. I used the essential oil from Calvin Klein’s Essential oil set called Citrus..it is really old, probably part of his Truth fragrance line! Use whatever you have handy. Mix all the ingredients well and store it in a good container, glass preferably, but I just had plastic..store it in the fridge! Use it up within a month.